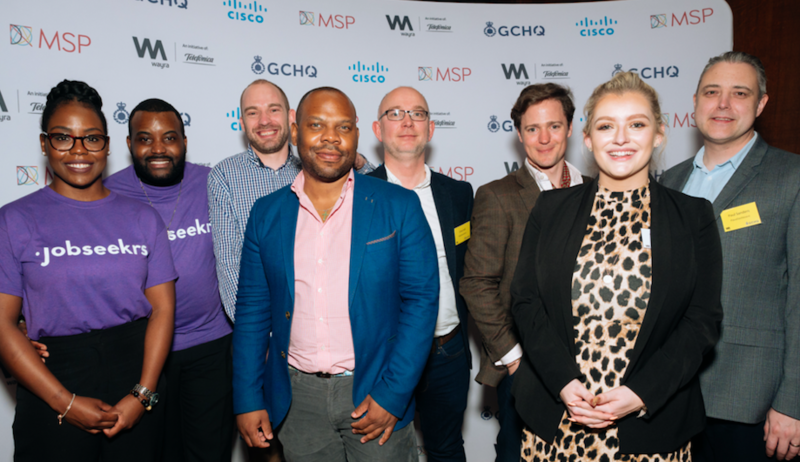 Four start-ups emerge from the ‘GCHQ Engineering Accelerator Manchester’, a ground-breaking programme launched by GCHQ, a world-leading intelligence, cyber and security agency, and Telefónica’s innovation arm, Wayra UK, having secured rapid growth for their businesses during the intensive 3-month programme. At an undisclosed location, PlaceDashboard, Jobseekrs, Locometric and Y?Not, gained exclusive access to the unrivalled technological and security expertise of GCHQ as well as IT heavyweight Cisco and Manchester Science Partnerships (MSP), to expand capability, improve ideas and devise cutting-edge products in areas including data engineering, machine learning and automation. The inaugural cohort shared its successes in front of 100 attendees at an exclusive Demo day in Manchester which included keynote speeches from the GCHQ Director General for Technology and Mayor of Greater Manchester Andy Burnham. During the course of the programme, PlaceDashboard closed a six-figure deal and increased revenues to help consolidate and strengthen its position as a big data disruptor. Locometric expanded its reach into the US market by securing a major partnership and building a closer relationship with technology giant Apple. jobseekrs were able to bring onboard 10 new strategic partners, while Y?Not used the opportunity to validate their concept ready for a launch soon. GCHQ also leveraged the opportunity of working alongside those start-ups operating on the frontiers of innovation. Wayra is the most global, connected and technological open innovation hub in the world. Under the Telefónica brand Wayra currently operates in 10 countries: Argentina, Brazil, Chile, Colombia, Germany, Mexico, Peru, Spain, the United Kingdom and Venezuela. Our hubs have raised over $248 million through third-party investors for our companies. Our global presence allows us to be at the helm of innovation, shoulder to shoulder with driven entrepreneurs and in a position to engage the right partners, corporate leaders, investors, serial entrepreneurs and leaders of industries for business. We have been committed partners for seven years and connect innovators with Telefónica and generate joint business opportunities. We offer unparalleled access to Telefónica’s 350 million customers and clients across multiple countries. We are a unique and effective interface between both entrepreneurs and our network of corporates, governments and other partners in the 17 countries in which Telefónica global operates. GCHQ is a world-leading intelligence, cyber and security agency with a mission to keep the UK safe. Our brilliant people use cutting-edge technology, technical ingenuity and wide-ranging partnerships to identify, analyse and disrupt threats. It is GCHQ's job to stay one step ahead of those who would do our nation and its people harm. From managing the cyber threat posed by other nation states to preventing terrorist attacks, keeping our children safe online and supporting our armed forces, the exceptional men and women of GCHQ operate on the frontline of global challenges. Our values of Integrity, Ingenuity, Impact and Teamwork permeate through everything we do and our strong community spirit enables everyone to play their part in keeping the nation safe. This year will see GCHQ celebrate its centenary. Throughout our history our blend of cutting-edge technology, ingenuity and great people have helped keep the country safe. As the world continues to change and new threats emerge, GCHQ will continue to be at the heart of the nation's security.